Come to Tustin Recreation Center for a fun filled family day! 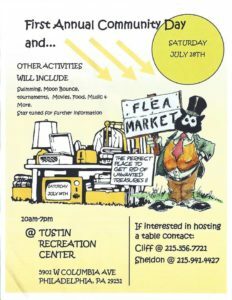 The first ever Tustin Recreation Community Day will be held July 28th and will include a Flea Market as well as activities such as moon-bounce, swimming, and tournaments. Enjoy time with your neighbors over a delicious meal while listening to music.